One nice thing about moving to a new home is that it allows you to start with a clean slate. 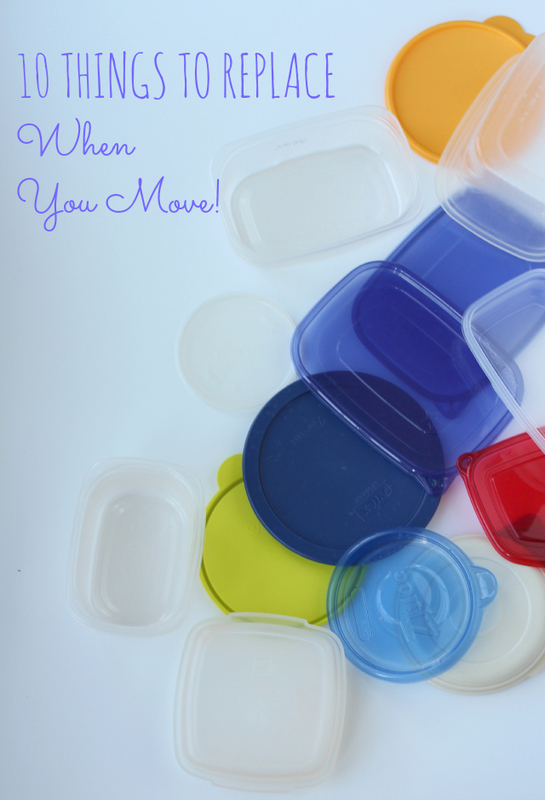 It’s a great opportunity to replace certain things I should’ve replaced a long time ago – like all our mismatched tupperware! Ross and I learned our lesson when we moved from Boston to Chicago that certain things aren’t worth putting on the moving truck. We ended up paying some crazy amount to have movers pack up our kitchen, including a couple boxes of canned goods that cost probably 3x the amount to pack them than they were worth. There will be no canned goods coming down with us to San Antonio! Mismatched tupperware – our motley collection consists mostly of recycled deli meat containers these days! I’m anxious to replace them with a nice stackable set like these from Rubbermaid. Dishtowels / dishcloths – with a new kitchen, I would like to replace our worn dishcloths with a bright new set. These brightly printed ones from Target caught my eye. Pantry items – I assume most people clean out their kitchen items before making a big move. We’ll be extra thorough this time around. Bathroom towels – when we got our set of towels as a wedding present they were fluffy and white. They are now just dingy. When we have guests stay with us, I find myself sorting through them to find the least dingiest to give them! They are long overdue for a replacement. Bedroom pillows – our pillows are several years old and I haven’t been great at regularly washing them. I think it would be nice to update them with new ones rather than pack them. Clothes – There will be a lot less need for wool sweaters in San Antonio. I’ve been whittling down my winter clothes quite a bit. Help! I realized I only made it to 8 on my “Top 10” list! What else would you add? Anything else that is better to get rid of than pack up and move across the country?